Hon. Dame B. A. Miller, Hon. D. D. Marshall, Hon. A. P. Wood, Mr R. St. C. Toppin, Hon. K. D. Symmonds. Mr. M. A. Lashley and Mr. R. L. Sealy. Hon. 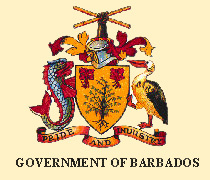 Miss M. A. Mottley: To move the passing of a Resolution to take note of and approve the Draft "National Strategic Plan of Barbados 2005-2025: Global Excellence, Barbadian Traditions". Notice of this Resolution was given on 5th July, 2005. Rt. Hon. O. S. Arthur: To move the Second Reading of the Customs (Petroleum Products Bulk Storage) (Validation of Fees) Bill, 2005. Notice of this Bill was given on 23rd September, 2005. The Bill was read a first time on 11th October, 2005. The Bill first appeared in the Official Gazette on 17th October, 2005. Hon. R. C. Eastmond: To move the Second Reading of the Occupational Pension Benefits (Miscellaneous Provisions) Bill, 2005. Hon. A. P. Wood: To move the passing of a Resolution to approve the Arts and Sport Promotion Fund Regulations, 2006 made by the Minister responsible for Finance on the 1st day of March, 2006. Notice of this Resolution was given 3rd March, 2006. Rt. Hon. O. S. Arthur: To move the Second Reading of the Appropriation Bill, 2006. Notice of this Bill was given on 14th March, 2006. The Bill was read a first time on 14th March, 2006. The Bill first appeared in the Official Gazette on the 20th March, 2006. Dr. William Duguid (Christ Church West): To ask the Minister of Housing, Lands and the Environment: 1. Will the Minister state: (a) whether her Ministry has any plans to build any more rental housing units in the Bennetts and St. Matthias areas? (b) whether her Ministry has any plans to build any more rental housing units in the Deacons, St. Michael area?